Popular entertainment is violent, so why aren't we allowed to talk about it? | Daily Review: Film, stage and music reviews, interviews and more. One day after an horrific act of terror occurred in a LGBTI nightclub in Florida, the video game industry kicked off its most significant event of the year, E3 in Los Angeles. For many, many years now E3 has been a mix of industry conference and a consumer event. Business leaders meet to nut out details on what game will appear on what console. Developers show publishers prototypes of their games in the hope of getting a pile of money dropped at their feet to complete it. Meanwhile, new games are announced to audiences of millions worldwide, and everyone comes out of the event knowing exactly what they’ll be playing in the year ahead. It’s not the kind of event that can be simply moved, or even altered at the last minute. Presentations would have been completed and rehearsed weeks ago, the press releases written, video recorded, and the hundreds of thousands of dollars paid to the event’s organisers. And then ten seconds later they were showing off footage of a game which involved splitting a person in two, or another game that had the protagonist complete an assassination with a swift knife to the throat – gore and all. The latter example was particularly striking to me, because this was a game that was designed to be able to be played without killing a single digital character. But because sneaking past people was just not exciting enough for a show of this magnitude, the demo footage instead was all about the murdering. 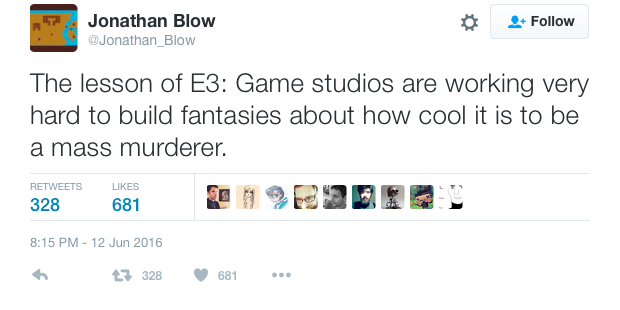 I’m not about to blame video games for the murder of people in real life. The science has found, via numerous studies over the years, that there’s no meaningful link between violent games and violent behaviour. I don’t believe in arguing against the validity of scientific studies when I’m not a scientist myself (also, climate change is real and people should get their kids vaccinated). I play and enjoy violent games myself – Mortal Kombat’s a favourite – and I know I have never felt the need to even hurt another person. So anecdotally I’m on board with the science as well. In the games industry not only is it unacceptable to criticise violence, but it’s unacceptable not to celebrate it. Western culture is a fundamentally violent one. We ritualise violence as entertainment in “sports” like professional wrestling, which are not sports at all, but pure-play entertainment products that exist purely around the concept of violence. 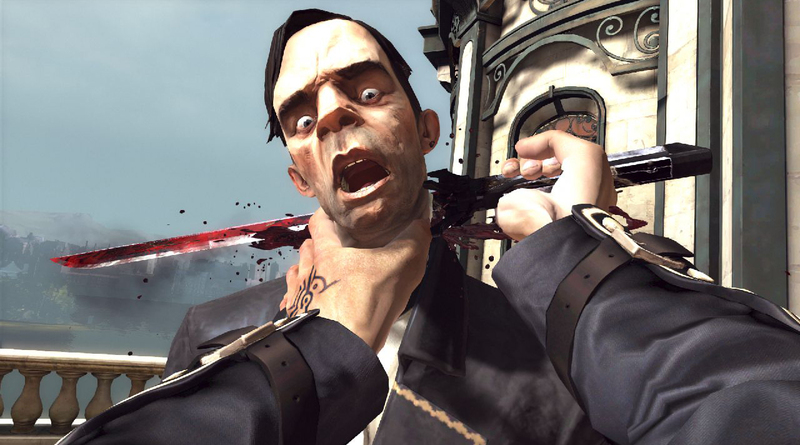 Almost every major video game release makes violence a core component of the experience. And films are no different; look at the actual death counts and destruction in a film like The Avengers. Violent films, games, and other enter entertainments are not causes of violence in society. They are symptoms. We find them entertaining because we exist in violent cultures. He was swamped by criticism for the commentary. Some of the criticism was well intentioned, and this is a good thing, because western society’s treatment of violence in its media is a necessary debate. From that point of view it’s easy to say that Blow’s commentary, provocative as it was, was ultimately positive in bringing the topic to the surface. But the majority of criticism that Blow received was reactionary and vitriolic. While there’s a bit more openness in other media about the role of violence in the media, in the games industry there is a sense that not only is it unacceptable to criticise violence, but it’s unacceptable not to celebrate it. Any other response is to cast yourself well into the role as an other – as best, someone who has a pretentious holier-than-thou attitude and is condescending to people who do enjoy their games violent. At worst, you’re cast as a “SJW,” – social justice warrior – which is most certainly a pejorative term applied by the large, and vocal, conservative gaming community. Humans, as a species, are fundamentally violent, and it’s no surprise in that context that our entertainment tends to fantasise about violence. There is nothing immoral about those that create these games, films, or other violent entertainment products, and anyone who suggests otherwise deeply misunderstands the topic. But equally it’s critical that we understand that someone that points out a commonality between populist entertainment and tragedies such as the massacre is not wrong. Trying to silence this discussion is no better than burying our heads in the sand and then acting surprised when it happens again. As someone who plays quite a lot of games, and spends a lot of their unoccupied time playing computer games, I actually concur with this – the vast majority of games, particularly the “A-List” games which are intended to be sold to the One True Demographic (male, aged between 15 and 30, middle-class, middle-income, predominantly white – the people who know all of culture is created to normalise them) tend to turn to violence as both the primary problem-creating and problem-solving mechanic. (Or in other words, if the only thing in your toolbox is a hammer, over time, everything starts to look more and more like a nail). My prime example of this: the EA game of “Dante’s Inferno” which came out about 5 years ago or thereabouts. Now, this was a game being made out of one of the primary pieces of literary satire created in the late Mediaeval period – a satire which was quite direct, and positively vicious at times, about how much the mediaeval Church of Rome diverged from the high ideals of its creators. It could have been a wonderful opportunity to write a story-rich game which examined how hard it is to actually follow the teachings of Christ; one which required the player to implement non-violent solutions which actually followed the rules of Christianity in order to actually “win” – following the default path of video games (which breaks so many of the commandments it isn’t funny) should have resulted in the player winding up stuffed into the ice suffering eternal damnation right next to Lucifer. Instead, what did we get? We got a bog-standard hack & slash game starring the default pale-skinned muscular hero armed with an edged weapon where all the problems could be solved by hitting your target(s) harder with the weapon in question. Oh, and he gets the girl at the end as a sort of trophy. Which is, in its own way, as predictable, bland and boring as a plate of porridge. Or as the procession of first-person-perspective pseudo-military shoot-’em-ups which have been produced by all the major gaming houses, and which follow predictable scenarios and predictable (if not identical) heroes around killing predictable enemies, picking up ammunition and medical kits, and doing it all over again. Or even the procession of various massively multi-player online games where you go out and bash the #@$& out of some computer generated opponent, heal yourselves up, and then do it again, until you’ve either collected all the things you were supposed to collect, escorted your target from point A to point B, or defeated the big bad nasty at the end of the story, possibly with a few inconsistent rewards dropped in to keep you clicking those mouse buttons. To be honest, it all gets rather dull after a while. It would be interesting to see what would happen if we gave developers a challenge: make a game which requires non-violent solutions for the optimal result. Brilliant article Matthew Sainsbury. And Johnathan Blow…you’ve articulated what thousands think but haven’t said. Thank you for saying it. I have never played a computer game in my life. ( 62 yo ) Did watch some junior staff play leisure suit larry about 100 years ago. They bore the shiite out of me. I can go back to when clockwork orange was on at my local bugpit. Within a week there were guys in the back bar of the Astor ( before it was a gay pub ) in boots and suspenders, just like the droogs, looking for some agro. I went out to the car and got mr tyrelever, just in case any festivities kicked off . As it turned out it started outside but mr plod stomped and punched them back to reality. If nitwits can be so influenced by a film you will never convince me that killing footy teams of people every night in a game wont loosen a wire or two. I have seen lots of real violence in my life, I don’t want to relive any of that in some game ! Life is violent. This is hardly a human phenomena. This kind of “why can’t we all just get along” naivety coupled with West-blaming (a favourite kind of victim blaming practised by so-called progressives) these days tends to ignore the facts. As a rule, human lives in the West aren’t actually that affected by violent as compared to even our mammalian counterparts – let alone the rest of the biological world. Human beings always tend to place more atention on more outlandish risks. Nobody talks about how car games might have some relationship to motor accidents do they? Because it doesn’t make for a condescendingly moral sanctimony about how you should be allowed to express an opinion so obvious as to be a tautology. Yes video-games and media contain *conflict*. Yes, sometimes that conflict is violent. Because it’s entertaining. Virtual conflicts allow us to enjoy the thrill of conflict and violence without actually physically harming each other or risking harm to ourselves. From a biological point of view it’s actually an effective mechanism for letting us blow off steam. Nobodies “silencing” the debate. It’s one that we’ve already had, time and time again and we come up with the same answer every time. You cannot blame people for being frustrated because you’re being asinine. Just because we’ve had a violent past, and present for that matter, doesn’t mean we should just accept that as normal or inarguable. The reason we are living in less violent (Western) times is precisely that we have evolved. I’d like to think we can continue on that path. I can see how violent games don’t necessarily lead to acts in the real world. If there were positive correlations then the US, with its ready supply of inexpensive and massively lethal anti-personnel weapons and its entrancement with grotesque and violent entertainment, would almost be under siege from serial killers and mass murderers. Some of my nearest and dearest are inveterate gamers, they’ll involve themselves in make believe mayhem and carnage at the drop of a hat, but really they’re loving and caring people and wouldn’t hurt a fly. I know there’s a dichotomy. It must be that the game playing community is made up of two sorts of people, those who have their fantasies under control and don’t cross the line into violent reality, and those who are disturbed enough to use games as training and psychological reinforcement, then go off and slaughter innocents. I’d like to know how many times Genghis Khan, Caligula,Vlad the Impaler or any distinguished members of the ruling classes of England, France, Spain, Portugal or any other bloodthirsty colonial era aggressors played Mortal Kombat before their tiny little minds were corrupted. Hitler and his loyal buddies also learned their craft long before the invention of monitors and game consoles. Do people rush to embrace Fairyland theories or absurdities because it’s easier than dealing with reality? The dopey censors’ version of escapism is the instinct to blame anything except the society we live in and its institutionalised values. Funny that truth is the thing that minions fear most. There’s a whole bunch of paragraphs in there dedicated to pointing out that there isn’t a link between video games and the massacres, that science supports the idea that games don’t cause people to become violent, and that I have no issues with violent games. Apparently you glossed over those. Wasn’t sure where you were going with this but I quite liked it. Having said that I should point out you have done what others have done before you, you forgot the victims i.e. the LGBTI. A community that embraces the comic culture and look for strong role models who they can relate to. Remember the backlash against Deadpool being portrayed as straight. Violence in games can borderline rediculous and over cruel but let’s not use it in relation to this tragedy. It is academic. SJW, I think your comment is (hopefully) unintentionally misleading. First, your own comment has conflated “violent behaviour” (already an imprecise term) and “aggression”. Aggression in the context of these media studies is often measured by (an increase in) the amount of time the subject is willing to expose another person to a painful or unpleasant stimulus like noise blasts or having a hand immersed in ice water, and usually closely follows exposure to the media in question (and the longer after exposure, the lower the effect). This is, for the moment, a perfectly defensible claim. Erm, life is fundamentally violent, dude. Stephan, I’m specifically talking about western culture in this instance. That is not to say there aren’t other violent cultures, or that life itself is not fundamentally violent. This isn’t an either/or thing.